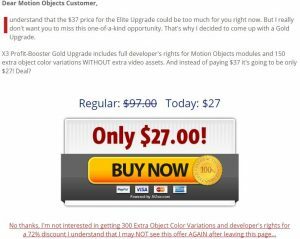 Motion Objects Review: Make Money Using Moving Pics? What’s Up Ya Internet Marketing Guys And Gals! I hope ya’ll are ready for another dose of reality as I hit you with another Stopping Scams review. Today’s review is sprinkled with a few grains of honesty, with a little bit of authenticity drizzled in, topped off with a big ol’ fat dollop of reliability (sounds like the complete opposite of my rebellious days). Let’s see if their product can help you transform your videos to attention-grabbing, money-making videos that can’t help but generate you stacks of cash. The ultimate, super handsome, extremely good looking team here at Stopping Scams are not affiliated with Lucas, Niranjan, or their product. We make sure that the reviews we write are honest, authentic, and have a dash of personality, so it’s not as if though you’re sitting at your computer in your pajamas listening to a lecture given by Microsoft Sam. We never allow a potential commission sway our reviews, and we’ll continue to do our best to educate you on which internet marketing products are worth your time, and which are complete garbage. With that being said, let’s move into the review. This one was a bit difficult for me to put my finger on. But ultimately, I reached the decision that for 95% of you, you probably shouldn’t purchase this product. 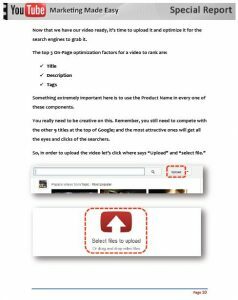 I don’t believe that what makes a successful internet marketing campaign is the amount of moving images on your videos, and even though they do look quite slick and attractive, it’s not going to play a huge part in your journey as a successful internet marketer. 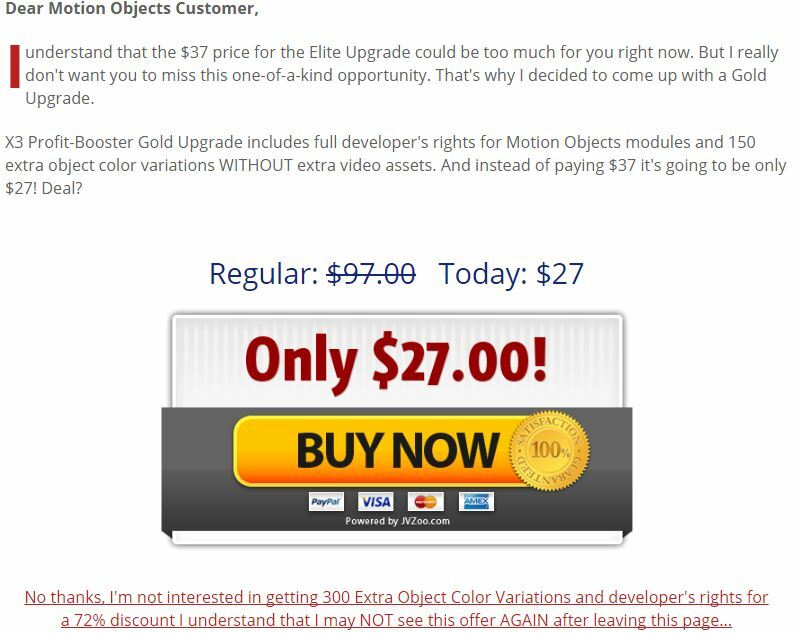 There was a total of five upsells and down sells that followed the purchase of Motion Objects. They included a bunch of other little gadgets such as more moving pictures, animated characters, and some other things that I couldn’t be bothered spending ten minutes analyzing. 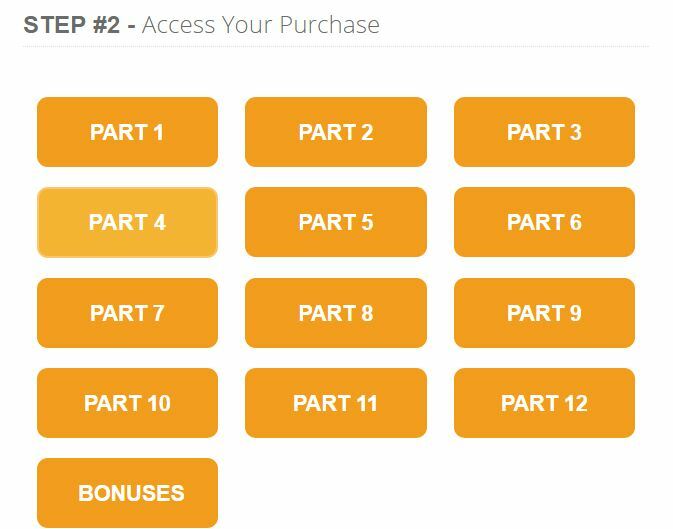 Man, I reaaaaally hate the upsell process that follows the purchase of a product. It takes so long to skip, and generally the products aren’t even that good; they’re just another way for the product creator to make a quick buck. In rare cases, the upsells look beneficial, but the majority of the time they’re just a pain in the old gluteus maximus. Once I skipped past all the upsells, I reached a membership site that looks like this. I’m not a video expert or a cartoon animator, but I thought I’d add this section in here for any of you guys or gals who happen to know a little about this sort of stuff. 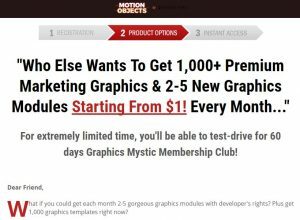 If you happen to be one of those people, Motion Objects could potentially be something that you’d like to check out. I went through the graphics provided as well as the training, and it actually looks pretty neat. Also, considering the fact that it’s less than 20 dollars, that’s not too expensive when you compare it to the use that you could get out of it. 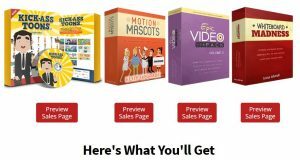 What I’m trying to say is that this product could be useful for the right type of person, but if you’re just new to internet marketing and you’re looking to create a successful, financially-thriving, value-pumping internet business, then it’s better than you save your time and money and invest it into something with a bit more quality and fundamental internet principles. 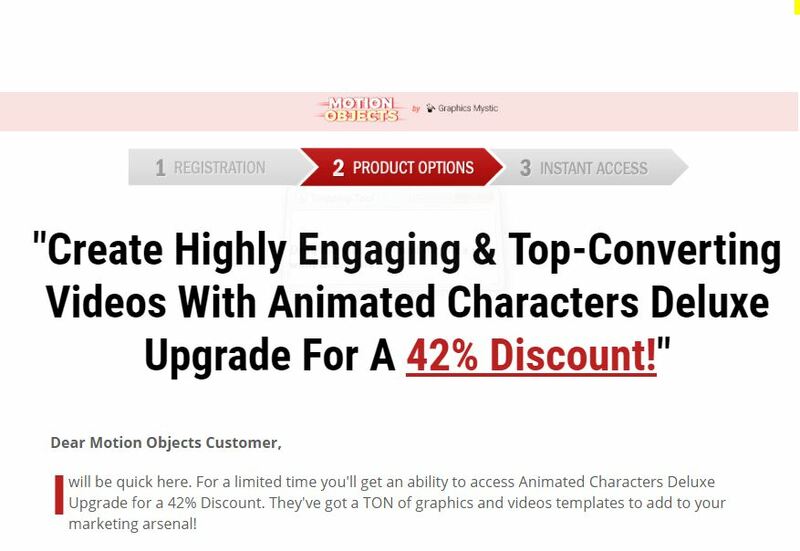 The number one reason why I wouldn’t recommend this product to 95% of you reading this is because a couple of neat looking moving pictures on your videos aren’t going to make or break your internet business. There’s so much more to a high-quality video that goes into it, and a few motion objects are more like the dab of whipped cream on top, rather than the ice cream itself. 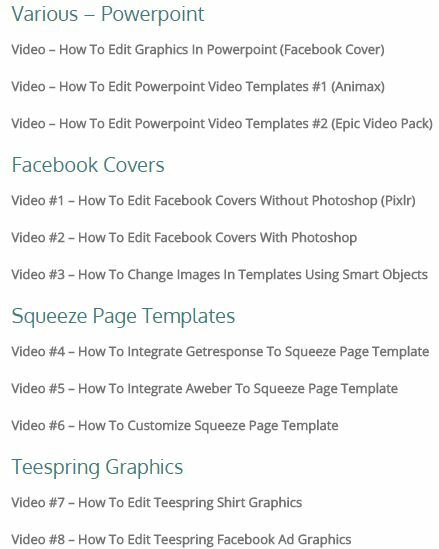 With that being said, you get access to a ton of content that a video creator/animator might find useful. Unfortunately, even though you’re given access to a ton of gifs and jpegs and all the pictures file types that you can name under the sun, that doesn’t mean that it’ll be of use to you and your internet marketing endeavors. 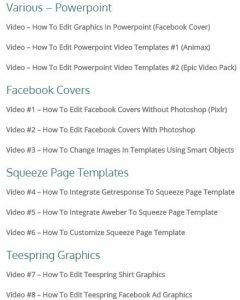 There are a ton of useful training videos available for anyone who decides to purchase this product. Not only have they included the files, but they’ve included training to help you use them for whatever reason you like. 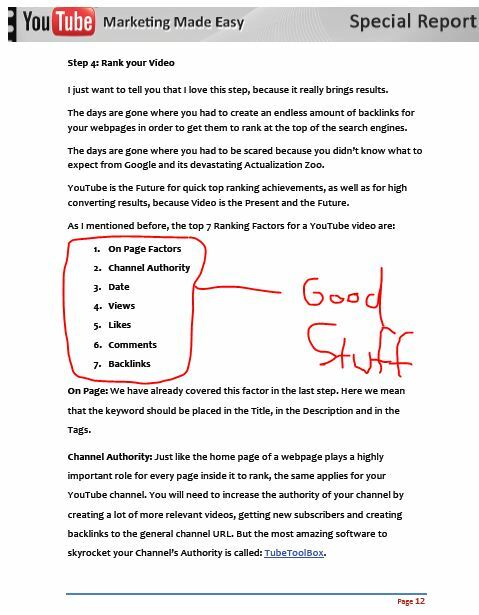 The “4 Easiest ways to start making money on Youtube” guide is actually pretty detailed. 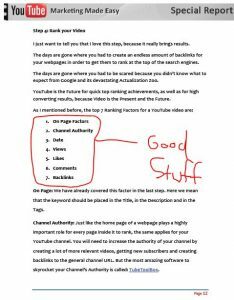 They mention a bunch of pretty fundamental internet marketing concepts, such as how to rank your Youtube video and potentially score an affiliate commission with screenshots to help you along the way. Check out the screenshots below for an example. 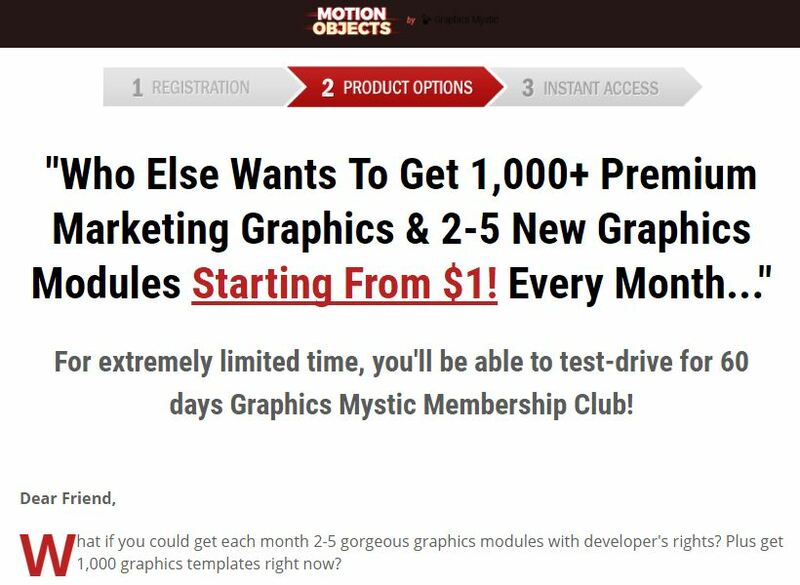 Unfortunately, despite the amount of “good stuff” the product has, I still wouldn’t consider it something that’s absolutely necessary for an internet marketer and his/her success in this industry. It’s like going to a vegetarian restaurant and cooking up the juiciest, tenderest steak you’ve ever seen in your life… steak cooked to medium rare with a little bit of garlic cut up to add to the flavor, and cooked in olive oil, closely followed by a spoonful of butter to add to the richness of it. But you’re at a vegetarian restaurant. It’s of no use to them. They can’t appreciate the “goodness” of the steak, and so it’s better that you just leave it be. Comment Below If You Wanna Know More! If you ever want to reach out to the team here at Stopping Scams, just send us a comment and we’ll do our best to serve you in the best way possible! The fuel that keeps this machine running is your success, so it pays to reach out to us and let us know if you ever need any help. Catch ya later ya Internet Marketing Fanatics! 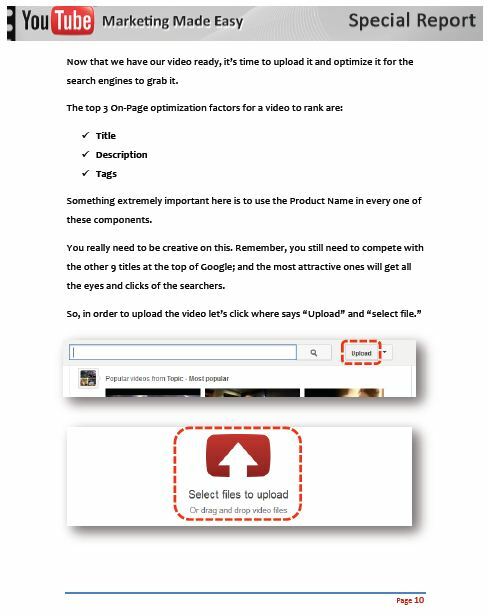 YT Gorilla Review: Can You Make Money From YouTube?